CC-300 CORIOconsole provides a Video Production Switcher type interface for the C2-3000/4000/5000/7000 series Video Processors. Two rows of 14 buttons are provided for Preview and Program functionality of mixed format sources. Fades and wipes may be either automatic with preset times or manually controlled via the fader bar. The joystick employs full range of motion to allow precise positioning of P-I-P inserts and other functions. The Integrated LCD touch screen plus fixed-purpose function keys combine with “soft” function keys to provide total control over multiple C2 series units. The CC-300 provides access to all controls with a minimum of keystrokes. Unleash the Power – A single CC-300 can control multiple CORIO2 devices. 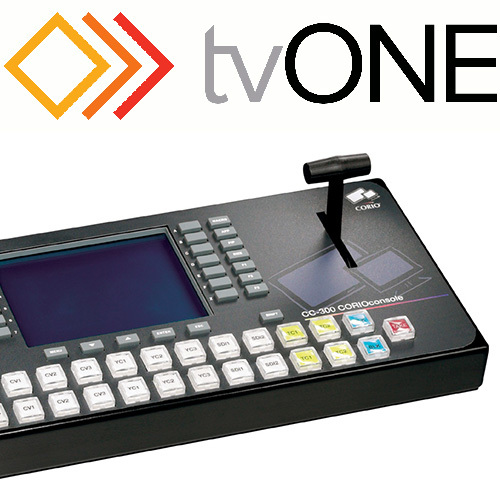 When used with a C2-7000 series unit, it provides all the functionality of a multi-format video switcher, complete with an independent preview channel. Freely mix between analog and digital signals in either video or computer formats. Flexibility - The CC-300 has a natural front to back slope, so it can be easily used on a desktop. It also comes with rack mounting hardware for installation in a standard 19” rack. Interface between the CC-300 and the C2 series device is via RS-232 or Ethernet with IP protocol. When the unit is powered up, it automatically polls and identifies any devices connected, such as C2 units or Calypso machine control units. The LCD and button illumination is adjustable, so they can be dimmed for easier viewing when working in darkened rooms. Machine Control - This option allows control of external devices directly from the CC-300 console’s touch screen LCD panel. These devices can be virtually anything that can be remote controlled by RS-232, RS-422, Ethernet, Infrared or GPI trigger, such as projectors, screens, lighting, recording or playback devices. The CC-300 interfaces directly to the Calypso Pro I/O or ION series.